FEATURES. Housing consists of a 16 gauge aluminum backplate with an square casting featuring an extruded tapered prismatic polycarbonate lens. Housing is fully sealed by temperature resistant, non-aging neoprene rubber and/or black EPDM gasketing. 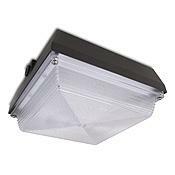 Standard energy efficient LED comes available in multiple color temperatures to choose from. Corrosion and weather resistant oven baked standard bronze polyester powder coated finish. Built according to U.S. and Canadian safety standards. Suitable for Dry or Wet Locations.